Rockefeller Plaza Pizza. Located in the bowels of 30 Rock, Harry's Italian Pizza Bar is rapidly churning out high quality square slices in one the busiest food courts in the country. Lucky are the tourists exploring NBC, Radio City, the ice skating rink, or the Top of the Rock' and happen upon this cozy outpost of the original financial district Harry's Italian Pizza Bar. 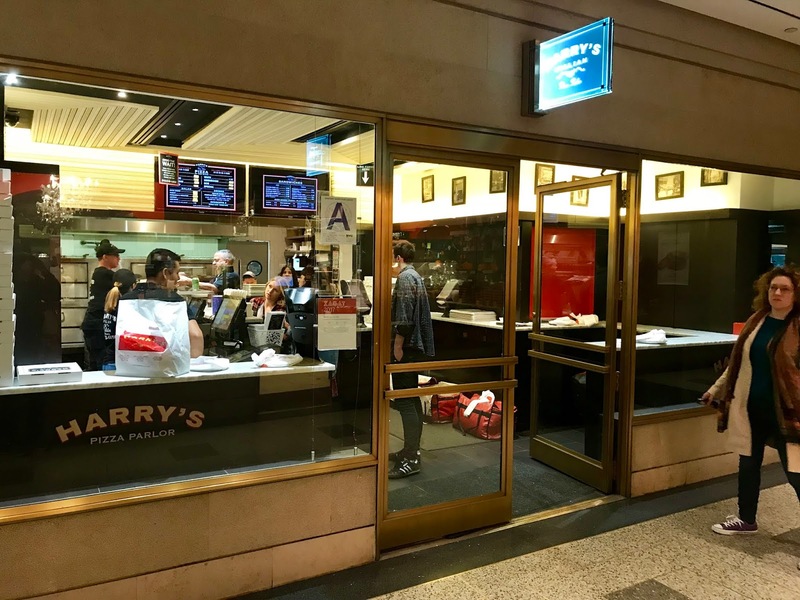 As employees of all of the places mentioned above can likely attest, Harry's serves a great slice. These surprisingly filling squares are loaded with melted fresh mozzarella cheese and flavorful toppings and sold at an affordable price. How do you exist in that area of midtown and charge an affordable price? The answer is you cram a large number of hungry patrons in to a very small place to grab their slices and get out. Whether you choose to jockey for a rare chair at the intimate dining area around the corner or eat it on the go, you can't stay here. It wouldn't be right to. 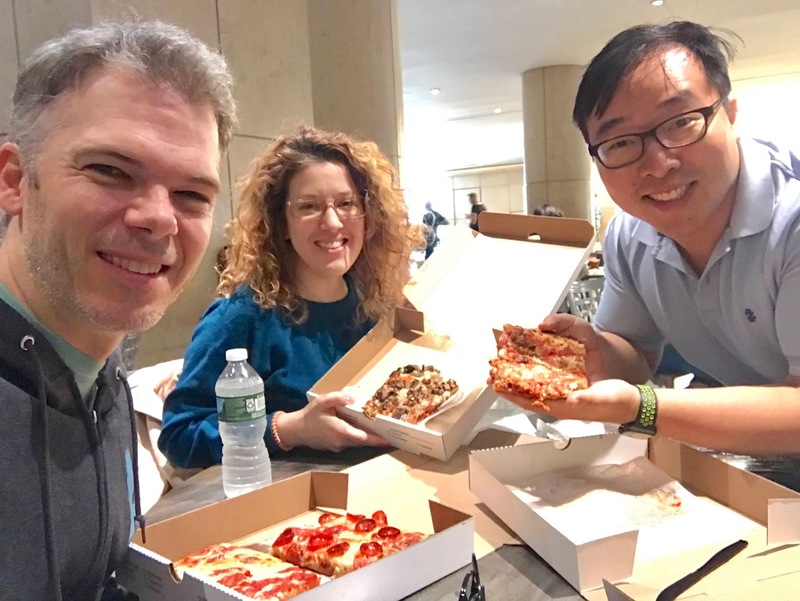 Let others get their mouthwatering slices and next time try to avoid the lunch rush. Don't expect patience, hospitality or a bathroom. Do expect a slice tasty enough to warrant a pavlovian response anytime someone mentions "Harry's Italian" from then on. 1. Bobby Yu was a competitive ballroom dancer until he got injured. Competition is tough and the distinction between "amatuer" and "professional" gets pretty fierce. I am currently ranked "noob." 2. Robin Rothman presented Bobby Yu with his very own postcard for her upcoming NYC fringe show. Now Bobby knows he can navigate over to Trudy Carmichael's website and secure himself some tickets (link to tickets). 3. After pizza, we were introduced to Lady M's thousand layer chocolate crepe cake. I hope it won't be the only time our paths cross. 4. My softball team won our game tonight. Afterward we stayed to do some batting practice. Although it was stupid in retrospect and could have wrecked my phone, I tried using the slow motion function on my phone to catch/shag a fly ball. Shagging fly balls are one of my favorite things to do in life. Daydreaming during the cold months, I picture myself chasing down fly balls. Now, I don't have to daydream it...I can just look at my video! Thanks, iPhone!